Clovelly Bay is a calm and safe beach for everyone to enjoy. Situated on the coastal walk, north of Gordons Bay, the sheltered beach is a favourite with family and friends to picnic, sunbake, swim and snorkel. The bay is set between tall rocky headlands and protected by a breakwater making it an ideal spot to swim in calm ocean waters. Large concrete platforms ideal for sunbaking extend around both sides of the bay, making the area look more like an ocean swimming pool than a beach. The coastal walk stretches the entire way around the small beach and parkland area. With toilet facilities, picnic and playground areas, it is the ideal place for family and friends to gather, take in the fresh sea air and enjoy the great outdoors. A large parking area is accessed via Victory Street , at the end of Clovelly Road. Sit back and relax with the perfect view over Clovelly Bay while sampling the tasty menu at the Seasalt Café (9664 5344,) an award winning restaurant. Located on the southern side of the bay, 10 metres from the water, the venue offers protectedand uninterrupted views overlooking Clovelly Bay . The small beach inside the narrow bay is a safe place for children of all ages to have fun playing in the sand, swimming and snorkelling. Paddle in the placid ocean waters or try building grand sandcastles on the beach. Play cricket on the sand, have fun throwing a frisbee or just sit back while soaking up the sun and the casual coastal atmosphere. It is relaxing to snorkel with the amazing array of marine life that swims in the bay. Ease yourself into the ocean swimming pool using the access steps and float through the cool and tranquil waters. A ramp on the northern side of the beach provides easy access for the disabled. As it is protected by a breakwater, the sheltered waters of the bay are a perfect place to explore the undersea world. Watch from above, the magnificent marine life that inhabits the area as you swim through the calm refreshing waters. Observe the different sea plants, star fish, coral, sponges, and schools of colourful fish such as the protected blue groper living in their natural environment. Lifeguards patrol Clovelly Bay throughout summer. 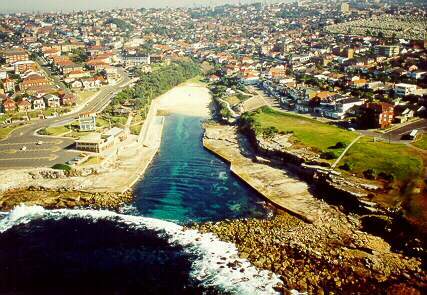 The surf club is situated along the southern side of the headland, near the large car park.